Image courtesy of Library of Congress As chairman of the House Judiciary Committee, Representative and Civil War Brigadier General Benjamin Butler of Massachusetts worked toward the passage of the Civil Rights Bill of 1875. 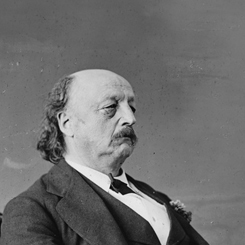 On this date, a special dispatch to the New York Times reported that Representative Benjamin Butler of Massachusetts would retire from the House. One of Congress’s most fiery and controversial leaders in the post-Civil War era, Butler had started his political career as a Democrat while an attorney in Boston. He served as one of President Abraham Lincoln’s most sensational and controversial generals during the Civil War. His iron-fisted management of the city of New Orleans after its capture earned him the nickname “Beast Butler” throughout the South. Butler had held a moderate approach to the issue of slavery, but his Civil War service changed his mind. Recalling the sacrifice of black Union soldiers, he declared on the House Floor, “May my right hand forget its cunning and my tongue cleave to the roof of my mouth if I ever fail to defend the rights of these men who have given their blood for me and my country.” First elected as a Republican in 1866 from Essex County, Massachusetts, Butler managed measures important to the Radical Republicans: the impeachment of President Andrew Johnson in 1868, the Ku Klux Klan Acts in the early 1870s, and the 1875 Civil Rights Bill. Butler lost his election in 1874 as a victim of a nationwide GOP backlash; however, he reclaimed his seat in 1876. He soon broke with President Rutherford B. Hayes and, after his retirement in 1879, returned to the Democratic Party. He was eventually elected governor of Massachusetts on the Democratic ticket in 1882.